So what’s in an IV anyway? When you get admitted to the hospital, one of the first things that happens is a nurse hooks you up to an IV, sometimes called a “drip.” Fluids in a plastic bag then flow through a tube and into your body. But have you ever wondered what exactly those fluids are and why you need them? Read on to find out. 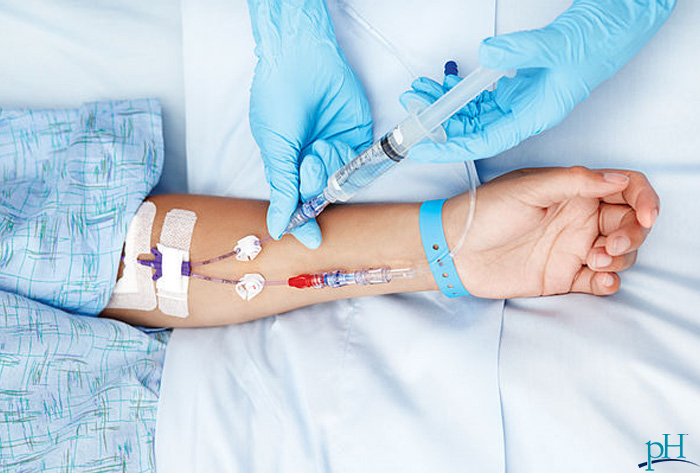 What is the purpose of an IV? Dehydration happens pretty quickly to humans, and impairs many body processes. Not drinking enough fluid hinders wound healing, immunity, concentration and digestion. So, the nurse hooks you up to fluids before anything else happens, to give you a better chance of fighting whatever ailment you have. The added benefit is that, because you might not be eating for quite some time due to a surgery or delay in getting a hospital bed, the hydration will hold you over until you can eat. Salt.The most commonly used fluid is normal saline. This is a salt solution of purified water. You can’t have plain water going into your veins. All the existing salt in your body, which you need, would rush out of cells and tissues where it is needed — not a good thing! Normal saline approximates the ratio of salt to water that exists naturally in the human body. Sugar. Sometimes the doctor will choose a dextrose, or sugar solution, that also contains salt. If you see “D5” written on the bag, that means sugar. These fluids are OK for people who do not have diabetes and who are not terribly dehydrated. If you have a bad infection, the doctor might not want to use D5, in order to keep your blood sugars well controlled to discourage the infection. Electrolytes. Some fluids may contain these minerals. One particular solution, for example, combines saline with bicarbonate, sugar and potassium. This is one of the preferred fluids for surgeries, likely because surgery can alter your electrolyte and acid-base balance. Vitamins. If you have a bright yellow bag hanging above your bed, it may mean you’ve been drinking too much. “Banana bags” contain multivitamins as well as fluids intended to replace the vitamin loss that drinking alcohol causes. Also remember that IV fluids, like medicine, can be contaminated. This doesn’t happen often, but when it does, the FDA issues alerts and recalls on MedWatch. Be proactive and educate yourself regarding what goes into your body. Will the IV liquid raise the patients sugar levels? Is IV like a shot? "Is an I.V. like a shot?" - yes. I.V means "intravenous". A needle with a small plastic tubing is inserted in a vein. Consecutively needle gets removed, while the plastic tubing stays inside the vein. The tubing and is connected to a bag of sterile fluid with a single or a combination of ingredients mentioned in our article. Usually the content of the bag drops slowly into a vein and is then distributed in the whole body. "Does an IV raise sugar levels?" The ingredients of an I.V. infusion are determined dependent what a patient needs. If someone is unable to eat after a surgery, sugar (glucose, dextrose) can be infused to supply quick "energy" to the body. Yes this can raise you blood sugar (glucose) levels slightly in a health way. This is a temporary desired effect. If someone already has a very high blood sugar, then the next step is to bring down high blood sugar with insulin and the initial iv does not contain any sugar (such dextrose). Later when blood sugar normalizes, some sugar may be added to adjust optimal levels together with insulin.